Who’s going to the ASHA Convention in LA this year? That’s where I’ll be November 9-11 and this will be my 5th ASHA convention. Honestly, with over 15,000 people atteding, it can be a little overwhelming. 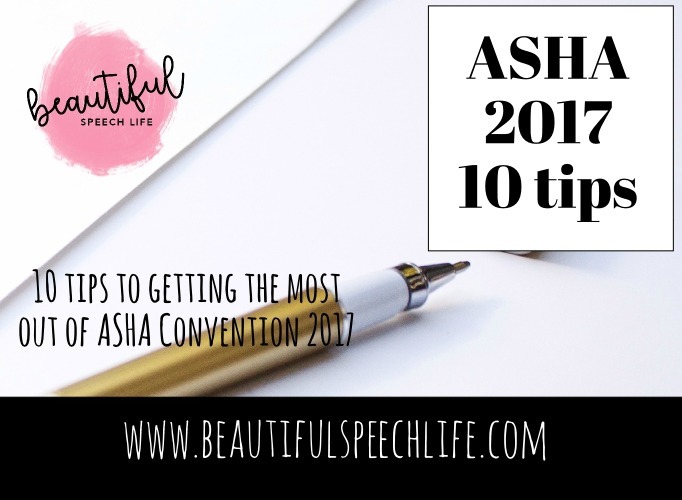 If you’re a first-timer (or even second or third), I’ve put together 10 tips to getting the most out of ASHA convention 2017. I know sometimes it’s fun to just wing it, but this is not one of those times. You’re probably spending a lot of money on registration, hotel room, meals, and travel. Let’s get the most bang for your buck, grab your program pocket planner (you should’ve received it in the mail) and highlight some of the courses that look really interesting. Then you can look them up online here. Think about what specific topics you’re most interested in. Maybe this is an area where you’d like to connect with like-minded SLPs. Show up early for the course so you can talk to some of the people sitting next to you. Even if you’re shy, it’s to say something like “I’m excited about this course” or “how’s the convention going for your so far?”, just break the ice. Talk to the presenters after their talk. When you’re walking around if you see an SLP blogger or TPT seller that you follow on social media, say hello. Some of the courses fill up quickly, so there early and grab a good seat for yourself. It’s no fun standing against the back wall for being in the overflow room. Plan ahead for your lunches. If you have back to back courses it’s pretty tricky to leave the convention center and get back on time. Because, let’s face it, everyone’s got to eat, so the restaurants get really crowded. I usually do a combination of the ASHA prepaid lunches and snacks. Or you could plan to skip one of the 1:00 sessions and have a fun lunch with some of your SLP friends. Yes, it’s okay, you don’t have to go to every time slot. It’s important to connect and network too. Really consider your footwear. You’re going to be walking a lot and standing a lot in the Exhibition Hall, so keep it comfortable and profesh. Of course, you can dress however you want. Remember you’re going to be sitting a lot, so you want to be comfortable. But you’re going to want to look professional too, (at least I do). I plan to dress in layers, because you never know what the temperature’s going to be like in each room. There’s nothing worse than trying to concentrate when you’re freezing or roasting. The first few times, it can be a little overwhelming because it’s HUGE. Get the floor plan that comes with your registration packet and have a look. (Or look at Tip #10) Does that sound geeky? I just remember my first time. I didn’t have a plan and I ended up getting completely overwhelmed and exhausted. Now I do it differently. I go through the floor plan and highlight all of the booths I know I can’t miss. Then, I make sure I go to those first. I also schedule myself a nice block of time to look at things. This is a great opportunity to check out some of the big vendor’s booths. There’s always tons of swag. Super Duper has a huge area (it’s like a store), where you can actually purchase therapy materials. They also give you a big huge tote bag to carry everything in. Again, plan ahead, you don’t want to be caring that huge bag with you all day to all your classes. Take advantage of being somewhere different. Go to some of the meetups, check out a fun restaurant, and maybe you’ll even have time to go to the beach. 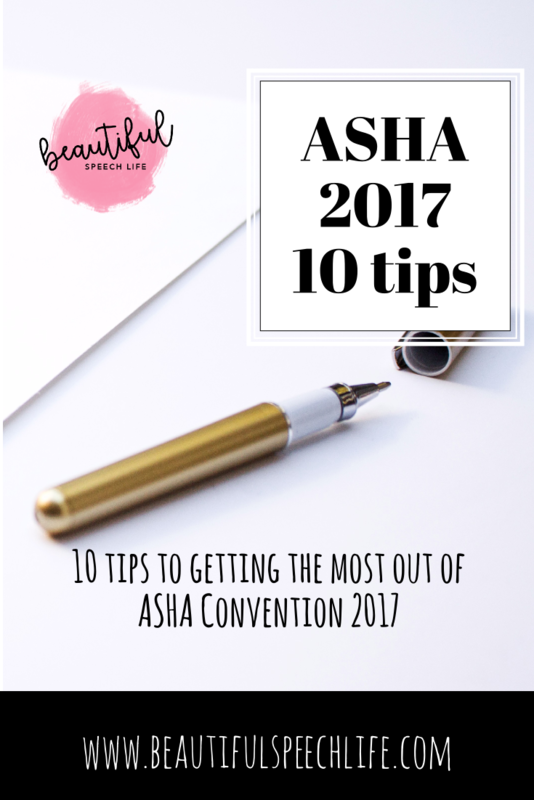 Tip #10 Get the ASHA 2017 Convention app. This free app allows you to sync your schedule and see your friends schedule. It also has maps and a What’s On Now feature to keep you totally in-the-know. That’s all for now. 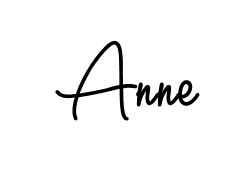 I hope you find these ten tips helpful and I would love to see you in Los Angeles! I’ll be posting on Instagram (Beautiful Speech Life) and maybe even Facebook Live. One of the best things about going to an ASHA convention is connecting. We all work so hard, it’s nice to have time to socialize with people who speak our language. I am glad you will be there too! I will be watching for you. are you presenting? Your tips are perfect, the snacks and water are the best ever! Thanks Tami! Did you get to use any of the tips? I didn’t present, but I went to some great sessions and learned a LOT!